trains operate between 148 St and South Ferry via the Chambers St Station. trains make all stops between Chambers St and Franklin Av. Local shuttle buses run between Franklin Av and Sutter Av. Sutter Av and New Lots Av. • Transfer between and trains at Chambers St.
• Transfer between trains and buses at Franklin Av. • Transfer between express and local shuttle buses at Sutter Av. trains operate between Woodlawn and Flatbush Av via the Franklin Av Station. OMG. The to South Ferry and the to Flatbush Av. Hell must've frozen over. There's gonna be mad foam over that. I doubt it , i mean we are all mature people here right? right? I usually only see bombardier 142s, now 142A's are gonna be running down there! Shuttle buses run between Hewes St and Essex St, stopping at Marcy Av. • Transfer between trains and buses at Hewes St and/or Essex St. They never did this all the time I worked the on weekends and I waited for any sort of G.O. (Though the eventually started doing the Crescent St. again, which continues). They're going back to throwing everybody out at Hewes, instead of just using one of the platforms at Marcy. Not only do crews have to clean out the train and relay, but then, the bus going the extra blocks to Hewes is slow! Did anyone notice what is also happening on Oct 20-21? Today I got to ride the 62s on the Nostrand Branch on the S/B track.... I ridden Redbirds, the 110A, 142s and the 62s on those rails. Needless to say the ride was rough (Braking wise) I remember the Redbirds being much smoother and was only bucky on takeoff. Riding N/B on the 62s had me reminiscing about when Redbirds ran on the line, I don't have many positive memories in life I enjoyed riding those trains back in the day, the 62s are not quite the same as the Redbirds but its close enough. Now I hope they have a G.O someday where the the goes to Flatbush so I could ride a 142A on the line. I think I'll be over there for that, I'm real interested to see what buses go out on that shuttle. The GO with the to Crescent St skipping Canal St and Bowery is happening again, 6 AM to 6 PM today and tomorrow. Anyone want to take a guess as to why this GO is gonna be in effect for pretty much the rest of 2012 beginning the first weekend of November? The way the mta site writes it up is misleading. 's will actually be operating betweeen DYRE and Flatbush, with shuttle trains between 241 and 180. • Transfer between trains at E 180 St to continue your trip. * trains replace the between Dyre Av and E 180 St during this time. Don't they usually avoid doing large GOs like that (no at all) during the holiday season? I'm gonna guess work at E180 or somewhere north of there on WPR where trains have less track space? Has the via 8 Av GO been canceled this weekend? 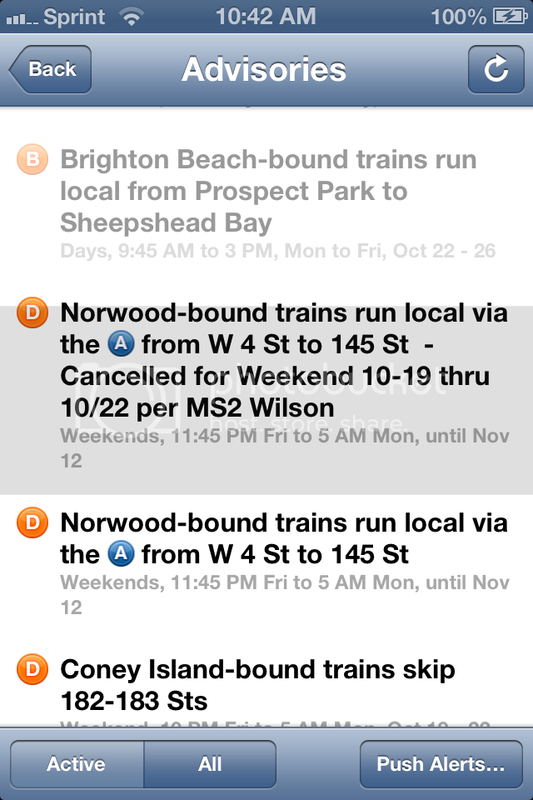 Its no longer on the MTA site, but the express is. FYI, the C line reroute is still in there, but I'd assume it was cancelled as well since the only reason the C was running express is because the D is running via 8th Avenue on the local tracks. - to Euclid during the day and Lefferts at night. Guess we are going to see some R160 this weekend. This is what they did with some of the trains last time. Now that I think of it...why did the MTA send the to South Ferry instead of turning the at Atlantic and sending the to Flatbush? Because the MTA loves us. I think sending the to Flatbush gives Nostrand Avenue residents two options for either East Side or West Side of Manhattan like the regular / weekday set up. It also helps reduce transfers for those who want Manhattan's East Side by transferring to the had the ran along with the via Nostrand and had the originate at Atlantic instead. The becomes completely packed at rush hour after its first stop at Utica whenever the comes or how the platforms often get crowded from my experience. I also think having the originate at South Ferry reduces the transfers to the Express on the Broadway-Seventh Avenue Line. Riders at South Ferry and Rector Street who want express service can stay on the all the way without transferring (unless if they need WPR service via the of course). Both the and run at abysmal headways on weekends so instead of transfering at Nevins in both directions, riders can stay on the or the entire way down and to also transfer at Franklin for the IRT Livonia Avenue Line shuttle buses that makes all the stops between Franklin and New Lots. I also think that it reduces the switching crew for the Eastern Parkway Line. Instead of having two switching crews at Atlantic and Franklin respectively, you only have one at Franklin for the Nostrand Avenue Junction. They already have switching crew at the South Ferry and Flatbush Avenue terminals and even at Chambers so its a win-for-win. Just my opinion by the way. Wow, that's way too many bullets for my fragile mind to decipher, so I'm gonna ignore the above post and give the answer. If the 4 turns at Atlantic, then riders who are going to Franklin and Utica from the east side are going to have to transfer to the 2 or 3, and THEN transfer to a bus. Sending the 4 to Franklin gives them a direct transfer to the buses. Sending the 3 to South Ferry is not a big deal, because riders going to Brooklyn can take the 2 on the SAME platform instead. I doubt there are many riders going from 148/145 to south of Franklin. In other words, the 4 to Flat and the 3 to South Ferry inconviences passengers a lot less than the 4 to Atlantic and the 3 to Flat would.